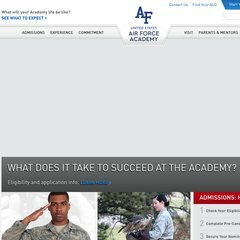 Topics: Cadet Branch Romero, Cadet Jenna Maxfield, Benefit Comparator, and Usafa Iphone App. Age: It went live on July 24th 2001, making it over 16 years, 8 months old. The estimated 421 daily visitors, each view 1.10 pages on average. It is hosted by Internap Network Services Corporation (Georgia, Atlanta,) using Apache web server. ns3.tribalddb.com, ns1.tribalddb.com, and ns2.tribalddb.com are its DNS Nameservers. Its IP Number is 216.52.186.106. Website load time is 750 milliseconds, less than 90% of other measured websites.